Capillary action is the ability of a liquid to flow upward in narrow spaces without the assistance of external forces. Capillary action allows water to move upward due to surface tension of the water molecules and intermolecular forces between the water and the surrounding surface. Different surfaces will exhibit different levels of adhesion of the water molecule. Capillary action occurs when the adhesion to the surrounding surface is stronger than the cohesion of the water molecules. For capillary action to exist, it must be pulling from a body of water. In a turf field, this would mean that water is backing up and not flowing through the turf and/or substrate. Meniscus in a tube. The water has an affinity for the sides of the tube. Thinner tubes have higher capillary action. Dangling a paper towel in a puddle. The water works its way up the paper towel. Do different materials have different capillary action? Yes. 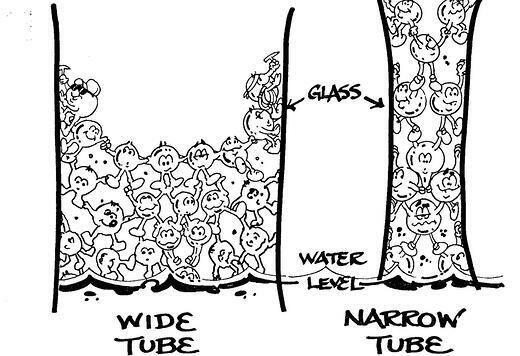 Remember back to chemistry class - the meniscus in a glass tube was the result of the surface tension and the attraction of the water molecule to the surface of the glass. The thinner the tube, the higher the meniscus. Different types of materials (ie plastic or glass) can affect the result. Relating it to infill… material such as small, angular sand with small void spaces will have stronger capillary action. Materials with larger void spaces will have weaker capillary action. This video also demonstrates the benefit of the coating. The adhesion between water and acrylic is less than that of water and sand. How does capillary action affect a synthetic turf sports field? If capillary action is occurring, its an indicator that the drainage has been impeded. If the drainage becomes blocked and water is pooled at the bottom of the infill layer, then capillary action can move water upward in the infill profile. How far upward depends on the infill material. The capillary action of Envirofill 12/20 is only about 0.25” above the water level, compared to ten inches for raw sand. Using the improper sand ballast for a performance infill like Safeshell or a TPE can move water upward and allow it to freeze, if the drainage becomes blocked. Capillary action needs a pool of water to pull from. Capillary action is not consistent across infills. Smaller, angular sands that are densely packed have high capillary action. Compared to non-coated, angular sands, Envirofill has the least amount of capillary action.